You know I’m a kimchi mama, being Korean and all. But I don’t limit myself to just kimchi, when it comes to eating fermented veggies. I love eating any fermented vegetables, including fermented green cabbage and cucumbers. Since I grew up eating kimchi, I often crave salty, sour fermented foods with my meals. During hot summers in Korea, my mom used to make vats of fermented cucumbers and we’d eat crunchy and refreshing fermented cukes, in addition to kimchi. Then, when we came to United states, she’d make the same with green cabbages too. Little did we know, the ones made with green cabbage was called sauerkraut in another country! But let me tell you, Germans have nuttin’ on me when it comes to fermented veggies! Actually, old worlds have a common thread when it comes to preserving foods by either pickling or fermenting. They knew how to make foods last longer before the industrial revolution when there were no appliances to keep their food fresh. The practice of eating fermented foods continued in my own home with eating kimchi but lately, I’ve been making sauerkraut or fermented cukes more often. The benefits of fermented foods is the same with sauerkraut or cukes or any vegetables for that matter. The distinct flavor from Lacto-fermentation (no, it has nothing to do with dairy) is created by Lactic Acid that good bacteria, Lactobacillus (and others), make and it might be too much for some people but it’s worth getting used to because of its amazing health benefits. Did you know that a mouthful of delicious homemade sauerkraut has as much good bacteria as a bottle of probiotics? And it’s so much cheaper than a bottle! Just remember, PICKLING is NOT the same as FERMENTING. When you pickle, you add vinegar but when you ferment, you DO NOT add vinegar. Vinegar will kill off any good bacteria in ferment. Just wanted to be clear on that. Yup. That’s it. That’s my biggest secret to fail-proof fermenting. I remember seeing my mom using the biggest rock she can fit in the kimchi jar to make sure every bit of cabbage is under the liquid before sealing the jar. You have to wait weeks or months for kimchi to be ready so you want to make sure it’s prepared the right way from get-go. Well, it’s the same for sauerkraut. But how do you do that when making sauerkraut? I’ll show you. No, you don’t have to go dig a rock from your garden. 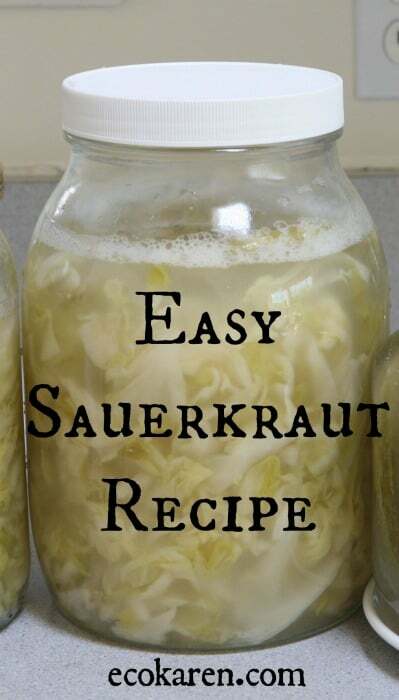 Here is my easy peasy sauerkraut recipe. ~1 Gallon of cold FILTERED water. Chlorine will kill the bacteria so it's important to use filtered non-chlorinated water. Clean your hands well. Place the shredded cabbage in the large glass bowl and sprinkle salt in between. Squeeze the cabbage pieces while you coat the cabbage with salt. This breaks down the cell wall and releases the juice faster so squeeeeze, squeeeeze and squeeeze some more. Pack the cabbage down into the bowl as hard as you can. Cover lightly with a dish towel, leave in a room temperature for about 2 hours. After 2 hours, mix the cabbage and the brine mixture well, while squeezing the cabbage pieces again to release more juice. Place the cabbage inside the glass jar and pack them in well. Now my secret to making sure all the cabbage pieces are submerged in the brine - without using plates or rocks - cover the top with the large cabbage leaves completely over the shredded pieces. <---VERY IMPORTANT! Pour the brine into the glass jar. If the cabbage pieces are not completely submerged, add cold filtered water (no chlorine please), just enough to cover them but leave about 2 inches at the top. Place the jar inside a cupboard so it will be undisturbed but easily accessible. Check the jar every 2 or 3 days to make sure the liquid is not overflowing. If you left 2 inches at the top, it shouldn't overflow, but just in case. This is also a good time to check for salinity. If it's not too salty, add more brine. If it's too salty, add more filtered water. Leave in the cupboard for about 3-4 weeks. You'll see little bubbles at the top, good bacteria doing it's job. Move the jar to the refrigerator and it should last for months....if you don't finish eating them before then. You can garnish with chopped scallions or chives with a little bit of juice and eat and drink the whole thing. With little bit of scallion flavor in the juice, it's refreshing and very tasty. Add cold filtered water if the juice is too salty. How much salt is enough? – There is no magic formula for salt to cabbage ratio – it’s just a personal preference. As a starting point, try 1 Tablespoons of sea salt to one head of cabbage. More salt will slow the fermentation process; less will speed it up. Ferments with less salt may be more prone to surface molds though. Some people ferment with no salt but I think that would be too bland. And you take a risk of having mold growing in the jar. Nor worth the risk, in my opinion. I like it a bit salty so I can eat it with meals. Whitish film or mold on top – If the cabbage is exposed to air, it will develop mold. That’s why I like using the large cabbage leaves to cover the top, just in case the cabbage pieces float to the top. Sometimes, especially if the room temperature is hot, you may see a thin white film on top. This is ok. It’s safe to discard it and eat what’s underneath. 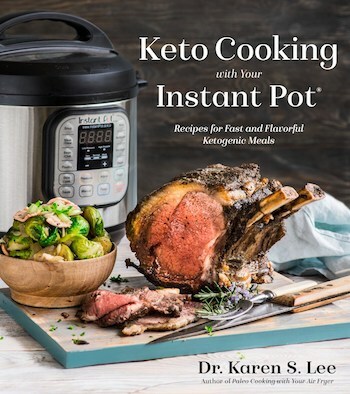 There are special ferment crock pots like this fermenting crock pot (Amazon Affiliate) to eliminate possible mold issue but I never had to use any special crock pots for making any fermented foods. Some people use the open-crock method where your veggies are in a bowl and a plate on top but no lid. I never used this method before and have no experience about the results. But others have used open crock pot method very successfully. 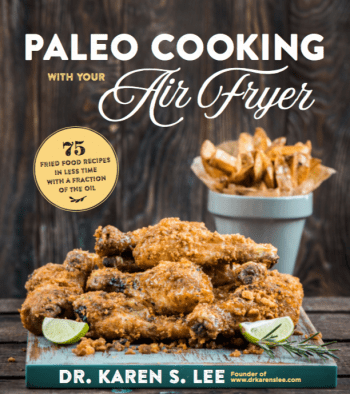 Floating white objects – perfectly normal and they are good for you. Mix it up and drink the juice. How long do you ferment? It depends on your taste. You can taste your cabbage after about a week to see if it’s ‘ripe’ for your taste. Longer period make ferments tangier, more sour. Warmer weather will ferment quicker too. To slow down fermentation, you can refrigerate and it’ll keep for months. 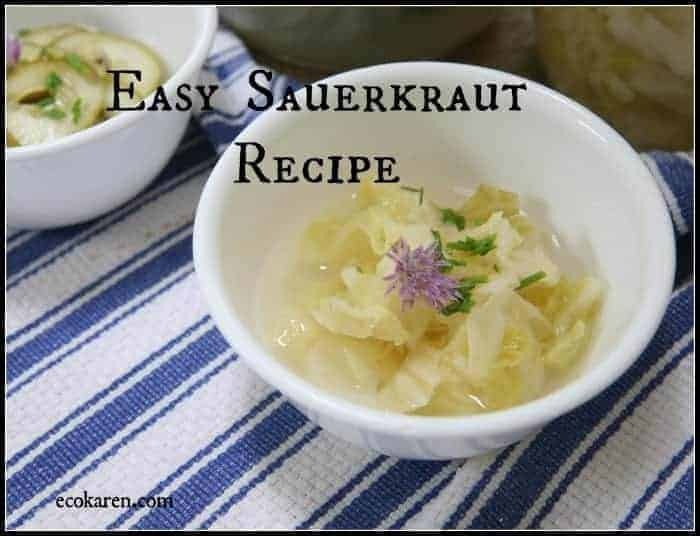 Reusing Sauerkraut Culture – once you’ve made sauerkraut, you can drink the juice – it’s full of probiotics – but leave some to be used for your next batch. It will make the next fermenting process much quicker.